both guided and self-guided trips in the UK, USA, Canada, Europe and Worldwide. Winter hiking guide service – guided hikes in the Adirondack Mountains during the colder weather season. Routes from forests trails and lake shores to a variety of mountain experiences. Trekking poles and daypacks can be provided. Walking holidays in Europe: France, Italy, Spain, Mallorca, Greece, Switzerland and Portugal – including a small selection of winter walking trips and snowshoeing adventures. Trips for all abilities and fitness levels. Guided and self-guided winter walking holidays and breaks in Europe. 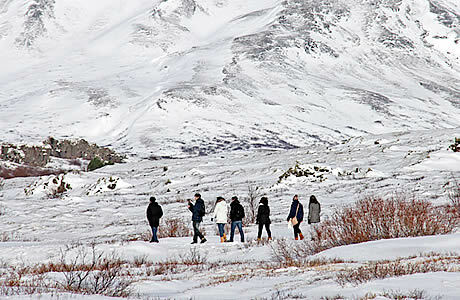 These tours make use of prepared winter hiking paths and established winter tracks and trails. Winter walking trips are available in both Switzerland and Austria. Guided winter mountain walking trips, walking the winter Munros. This is an all-inclusive winter hiking holiday with a guide, in and around the Cairngorms National Park in the Scottish Highlands. Winter walking holidays in Scotland, from easy rambles to mountain ascents ensuring there are trips suitable for most types of walker. Their easier, low level, hikes don't involve ice axes or crampons, while their Winter Skills trips are for more experienced walkers. Walking in winter conditions allows people to enjoy the splendor of the snow covered hills and mountains without having to learn the skills required to ski or board. It often uses marked forest, valley and mountain tracks and trails. This section specifically covers hiking and walking holidays during winter months and involving walking in the cold and in snow and ice. 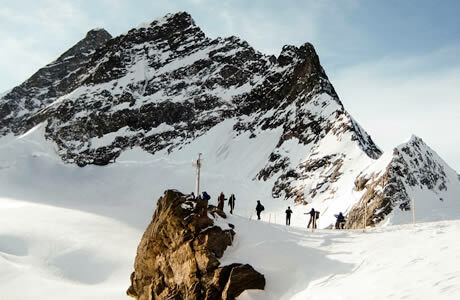 This ranges from low-level walks that don't require addition skills or equipment and may use prepared winter hiking routes; to higher altitude walks where the routes may be on snow slopes and glaciers and where winter mountain skills (such as glacier travel and rescue) and specialist equipment (such as ice axes and crampons) may be required. Generally these winter walking tours will focus on hiking using boots (and crampons where necessary), perhaps with occasional use of snowshoes – but we have a separate section dealing with full-on snowshoe trekking. This section specifically cover tours taking people on winter walking routes, we have a separate mountain section covering courses teaching the skills required for winter walking and hiking (such as the use of crampons and ice axes, winter navigation, glacier travel, avalanche awareness, and survival skills). Travel-quest's winter walking holidays category is for holiday packages offering hiking and walking during the winter months and involving walking over snow and ice. If you offer mixed activity holidays then these activities must be a significant component. See the walk/trek/hike index for separate sections covering other types of walking holiday. Unless credited otherwise, any photos used on this page are copyright of the Travel-Quest Directory or of the companies listed. See our Photography Policy for more details (including any credits for photo collages). Any other specific credits for this page now follow.